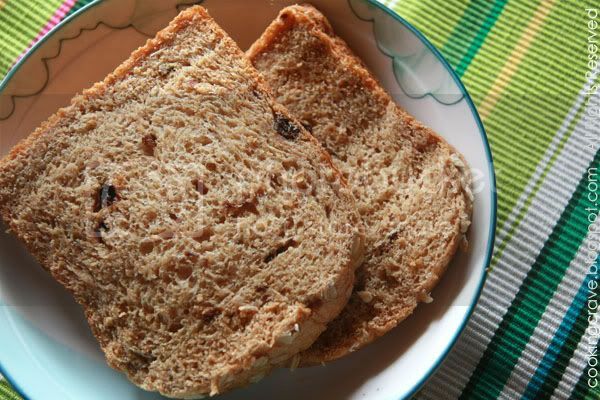 I try out this Wholegrain Raisins Toast using my new breadmaker and it turn out perfectly. A very healthy toast and it taste very yummy too. The bread stay soft after 2 days. 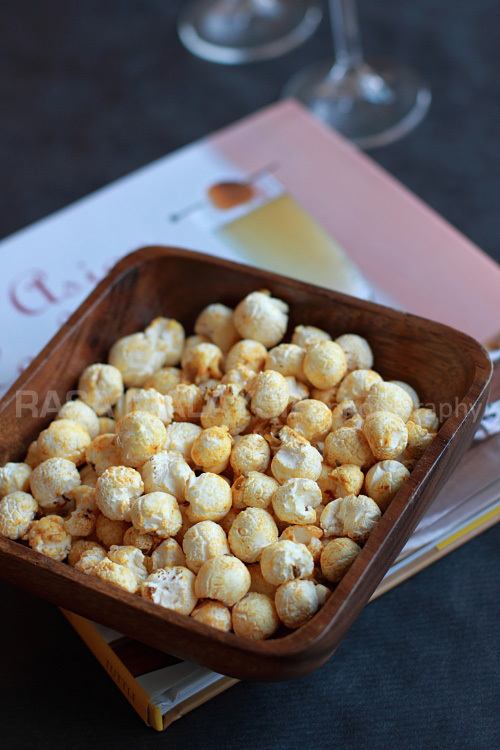 Try this out if you want something healthy for your breakfast. Blend ingredients A at slow speed in a mixer for 1 minute, then switch to medium speed for another 5 minutes till bread dough is coarse. Add ingredient B, continue to knead till bread dough is shiny and springy. Place in container and cover with cling wrap, allow to leaven for 40 - 50 minutes till bread dough double it size. 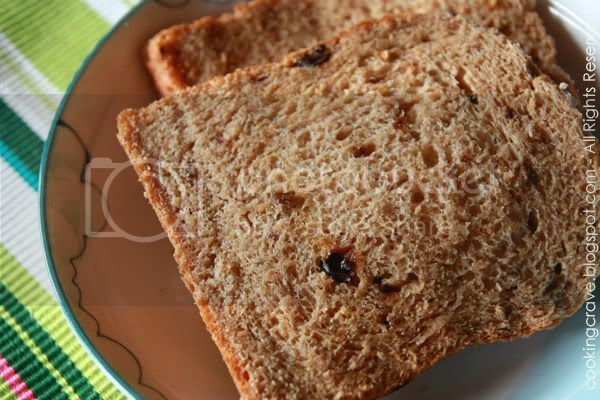 Cut out a 500g portion, make it round, proof for 10 minutes, roll it into a long strip, place soaked raisins and chopped walnuts on top, roll up into oval shape, place into bread pan, allow to leave for 40 minutes. Place into pre-heated oven, bake at 200c for 25 to 30 minutes. Cold the baked toast on wire rack, sliced and it's ready to be served with butter or jam. p/s: I sprinkled some rolled oats on the surface of the toast and omit the chopped walnuts as my kids they don't like nuts in the bread. *I baked this toast straight with my breadmaker and surprisingly it turn out just perfect, SOFT & FLUFFY! It remained soft for the next 2 days and I have no regret getting this breadmaker after all! Been thinking of getting a bread maker for a while since we ate a lot of bread. After reading your post, I think we should renew our search for a good bread maker. Colin - I got to know from my friend that the brand I bought are not available in USA. I will take some pics and post it in my BLOG soon. May I know if you have baked the bread in oven or in the breadmaker? Mui Mui - Hello, welcome to my BLOG! 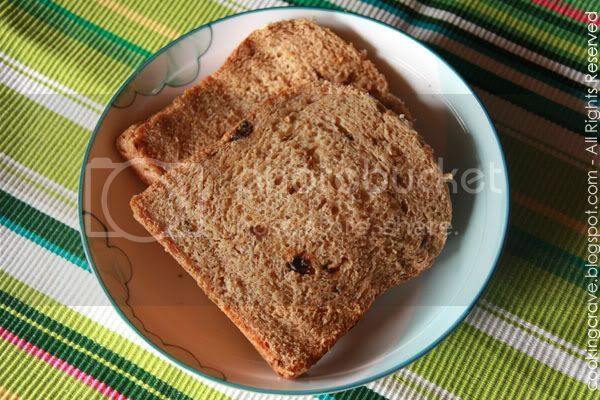 I bake this "Wholegrain Raisins Toast" straight in the breadmaker. However, you can bake it in the oven too after proof it by divided it into 3 equal balls and roll it into springroll shape, let it proof again before bake it in the oven. Thanks for replying. I've tried this recipe and bake it in my Kenwood Breadmaker BM256. However, the bread turned out to be dense and bit heavy. I do not know why it looked so different from yours. :( Which brand of wholemeal flour did you use? I used the Graham brand wholemeal flour. Mui Mui - I'm sorry to hear that the bread doesn't turn out as you want. There are many reason that cause the bread turn out dense and heavy. 1. Too much liquid or butter, make sure you measured all the ingredients accurately. 2. The dough not proof long enough before you bake it? By the way, I use the Organic Wholemeal Flour bought from Tesco.